The most recent item to be added to Fortnite is a building destroying boombox. The boombox can destroy existing structures and those that are newly built giving the holder of the item a big advantage in 1v1 fire fights. The boombox can be found in chests around the map and when placed on the ground it will destroy nearby (it has a range of 3 tiles) structures every time its bass pulses which is more than once per second. Enemy players can destroy it by shooting it but the boombox comes with 600 health making it tricky to take down quickly. The owner of the boombox is definitely going to have an advantage vs the players who like to build making it virtually impossible for opponents to spam walls to protect themselves. The boombox can also be attached to vehicles essentially making them mobile wrecking balls which could actually lead to quite a lot of fun as you tear around the map. Player response has been mixed with many claiming the item is too overpowered. Will the boombox remain as it is or go the way of the Infinity blade? 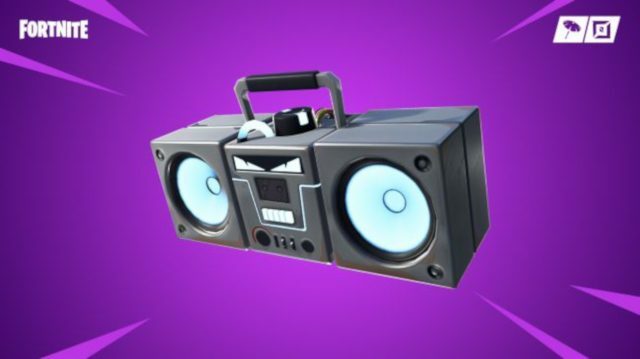 Only time will tell but Epic Games are usually pretty good at listening to the community and I imagine that the boombox will remain but with a few tweaks to make it more balanced. Check out the official Fortnite website for more information. Is Hado the next step in e-sports?